Remember the Night (1940), starring Fred MacMurray and Barbara Stanwyck, is one of the 1001 classic movies you should see. Each Monday, I'm going to recommend a classic movie you should see (for the reasons behind the 1001 series and reviews of earlier films covered go here). December's theme is Christmas movies starring Barbara Stanwyck starting with the romantic comedy, Remember the Night (1940). Remember the Night tells the story of up-and-coming New York City prosecutor John Sargent (Fred MacMurray) who is assigned the case of a shoplifter Lee Leander (Stanwyck), just before Christmas. Sargent, who is afraid that a sentimental jury will go light on the attractive Lee because of the holidays, gets the case postponed until after New Year's Day. However, John begins to feel bad about leaving Lee in jail during the holidays, so, in a last-minute act of kindness, he bails her out of the clinker and lets her tag along during his annual trip to his mother's farmhouse in Wabash, Ind. 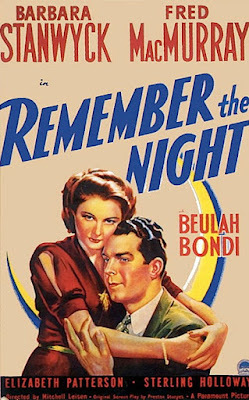 Remember the Night was based on an original screenplay from Preston Sturges, who was then one of the top screenwriters at Paramount Pictures. The much-married Sturges took inspiration from two of his four wives for the plot -- he and second wife, Eleanor Hutton, took an eventful road trip to Palm Beach, Fla., and his third wife, Louise Sargent Tevis, came from an Indiana family with a mother much like Beulah Bondi's character. The completed movie was a box-office hit that launched Sturges as one of old Hollywood's few successful writer-directors, and established Stanwyck and MacMurray as a top screen team. In the Old Hollywood Christmas movie canon, Remember the Night lies somewhere between the sentimental nostalgia of Little Women (1933 and 1949) and the dark pathos of It's a Wonderful Life (1946). The movie, although officially billed as a romantic comedy, has quite a few shifts of tone throughout its 91-minute running time. The film starts out as a screwball road trip a la It Happened One Night (1934) and then shifts to Hallmark Christmas movie territory during John and Lee's stay in Indiana. After all that holiday cheer, the noirish tone of the final third of the movie is actually quite surprising (apparently you could get put away for a long time in 1940 for stealing a bracelet). 1. Stanwyck and MacMurray. This was the first of four films together for one of old Hollywood's most memorable duos. Their other movies are the noir, Double Indemnity (1944), the Western, The Moonlighter (1953), and the melodrama, There's Always Tomorrow (1956). 2. Stanwyck and Sturges. The screenwriter was so impressed by Stanwyck's professionalism and comic timing during the filming of Remember the Night that he wrote the part of beautiful con artist Jean Harrington in The Lady Eve (1941) especially for her. 3. The script. Director Mitchell Leisen's habit of cutting the shooting script during production so enraged Sturges that it inadvertently launched his career as a director. He took over the director's chair for the film version of his next script, the political satire The Great McGinty (1940). 4 Willard Robertson. Remember the Night has several outstanding character actors, but the standout performance comes from Robertson as Lee's florid defense attorney. The lawyer turned actor stalks the courtroom like a highly caffeinated Perry Mason while spouting any bizarro theory that he believes can get his client off the hook (at one point he proposes hypnotism by precious jewels). 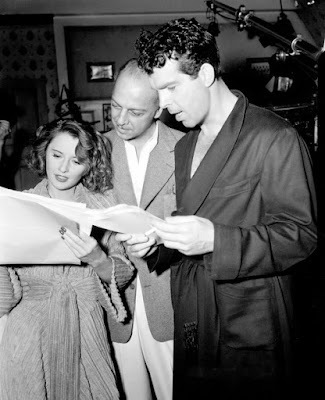 Barbara Stanwyck, director Mitchell Leisen, and Fred MacMurray study the script on the set of Remember the Night (1940). Other critics: Remember the Night has an 100 percent fresh rating at Rotten Tomatoes and Leonard Maltin writes that the film "builds masterfully as it creates a very special mood" in a three and 1\2 star review for his Classic Movie Guide. Critics in 1940 were impressed with the movie. The New York Times critic Frank S. Nugent handed out an unqualified rave writing that he Remember the Night was one of the 10 best films of 1940. He praised both MacMurray and Stanwyck's performances, writing that the film was "a drama stated in the simplest human terms of comedy and sentiment, tenderness and generosity." The bottom line: If you're looking for a classic Christmas movie besides It's a Wonderful Life to watch this holiday season, check out Remember the Night. It's a sentimental and very funny holiday movie with great performances from two of old Hollywood's all-time greats. Availability: Remember the Night will air at 9:45 p.m. Dec. 22 on TCM. It is also available on DVD. 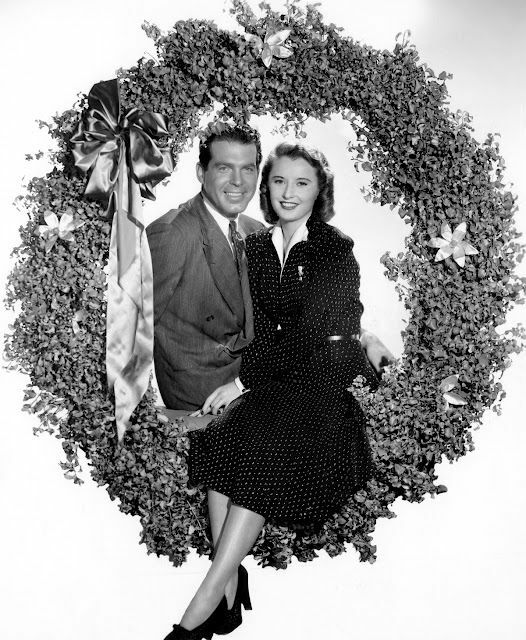 Next week, I'll continue the Barbara Stanwyck Christmas movies with director Frank Capra's timely satire, Meet John Doe (1941). Oooh - I love this movie! You description of "a highly caffeinated Perry Mason" is hilarious. When I first saw that scene, I thought it went on too long, but the more I saw it, the more off-the-wall hilarious it seemed. I can't say for sure but I think he is trying to imitate the famous defense attorney Clarence Darrow, who gave days-long closing arguments that even left judges in tears.